Formoid is a free desktop app that helps you easily create jquery contact form, jquery post form, html5 form, jquery contact form and more in a few seconds without writing a single line of code. 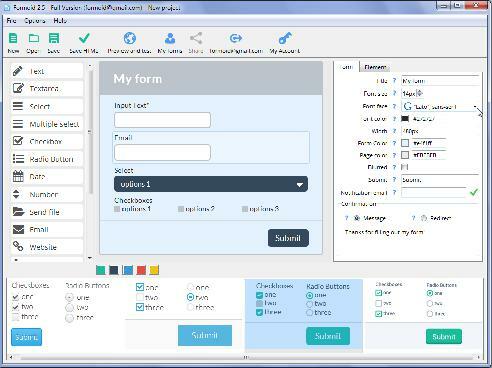 Create cool online forms in just a few clicks. Recently I purchased the program. It looks good. One problem. Where do you reset or change the email address on a form after you create it? Hello. I create form with your application. Great product! But now I want change email. How can I do it? How do I change the email address forms go to? Thanks. The problem isn't the activation key. When I insert the key, it says "The key is already activated with another email address. Hi, I downloaded and tested New. It's a good app overall so I apologize if my feedback only mentions flaws. • The New, Open and Save icons are not intuitive. Hi, I downloaded your Formoid tool because I was intrigued by what I thought it could do. It’s a very interesting concept.